I became interested in food at the age of 10. Between the ages of 10 and 17 I was spending a lot of time in the kitchen with my mother learning family recipes and how to cook from scratch. Officially, the penny dropped for me while taking a gap year from college and working at a restaurant. It was during this time that culinary arts had spoken to my soul, and from that time on I knew what I wanted to do in life. However, I came from a military-oriented family and I was the oldest of five siblings, so I also knew that I was going to join the service. I was the fifth generation to go into the service and I felt it was my obligation. While serving in the Air Force, I lived overseas in Asia and Europe for 22 years and developed many personal relationships with our NATO allies. I fostered those relationships and continued to actively study the culinary arts and gastronomy, knowing that someday I would be able to utilize what I had learned once I returned to the U.S. What I did not expect was a separate calling into culinary. With some imagination and a lot of creativity, I was able to pursue both. After finishing my service commitment, I went to graduate school. While in grad school, my dean wrote a letter of recommendation to attend the CIA and I was accepted into the Accelerated Culinary Arts Program. What previous college degrees do you have? I have an undergraduate degree in Logistics and Supply Chain Management, and a graduate degree in Hotel & Restaurant Management. Interestingly enough, I didn’t always know about the CIA. While serving overseas, I didn’t spend any of my leisure time watching television or surfing the internet. It wasn’t until I was on a special-duty assignment working directly for a four-star general that I found out about the CIA. When he discovered that I aspired to be a chef once I finished my service commitment, he called me into his office for a private meeting. During this meeting he asked if I would be interested in officially retraining to be a General’s Aide, where he immediately followed with, “we’ll send you to the best school—The Culinary Institute of America.” He would go on to write me a letter of recommendation. Since that meeting, eight years ago, the CIA has been the only school on my radar. This college has a long-standing tradition and a lineage of culinary professionals that supersedes all other institutions. The CIA is the West Point of culinary education. Scholarships have played an integral part in my education. Because the CIA supports the Post-9/11 GI Bill and invests in the Yellow Ribbon Program, it has been most beneficial. I was also the recipient of the Vi Living endowment scholarship. Additionally, after completing my culinary program, I was also accepted as a candidate for the 2018–19 Wine and Beverage Graduate Certification (WBGC) program. As a result, I applied for—and was granted—a Resident Assistant (RA) position. Because the RA position is in essence an official grant, it helps defray the cost of room and board, which is not covered by the Post-9/11 GI Bill or Yellow Ribbon program. There are many things I like about the CIA. One is the extensive knowledge of the chef-instructors. Over the course of my ACAP tenure, we had six different chef-instructors. Combined, these six instructors had well over 100 years of culinary wisdom. All of them had different personalities, different backgrounds, and different culinary techniques—but they all had the same excellent result. They were all enthusiastic in their lectures and daily demonstrations. Because ACAP’s schedule was predominately in the afternoon, I wasn’t able to participate in as many functions as I would have liked. However, I was an active member in the Veterans Club. We hosted the first Veterans luncheon, which was extended to all students. As a result, students were able to share concepts, innovative ideas, networking initiatives, and experiences with each other. I also volunteered as a host for the quarterly Yountville Veterans Home breakfast assemblies. I can’t pinpoint my favorite. However, I can say that I thoroughly enjoy cooking French and Italian cuisine. In large part because I spent more time living in Europe than I have in the United States, it has a special place within me. I learned many valuable lessons from chefs and restaurateurs from these regions, which still resonate with me today. I also enjoyed going to the farmers’ market to source fresh ingredients and converse about sustainability initiatives. Over the past several years, it’s been a new concept in the U.S. but over in Europe it’s been a lifestyle for centuries. My previous education along with my cultural education abroad—in conjunction with my tenure at the CIA—has prepared me for a variety of food and beverage venues. Having a working knowledge and understanding of the nuances associated with working in a professional kitchen enables you to be a consummate hospitality executive holistically. You’re no longer one-dimensional. Your approach towards providing outstanding hospitality for your company progresses into a 3D, ultra-high-definition projection as you interact with staff, vendors, the restaurateur, and guests. In the current industry culture, consumers want to know more about the chefs, sustainability, wine, sommeliers, and the owner as they frequent various dining venues. A CIA education embodies these areas and more. One of the best lessons learned while at the CIA is the ability to quickly adapt. Depending on the particular program, the campus, and the instructor, students will be required to readily adapt. As I mentioned earlier, the ACAP schedule was completely different than what I thought it would be. Furthermore, the evacuation due to the Napa Valley wildfires threw everyone off schedule, but we all quickly adjusted. The camaraderie and benevolence illustrated by the entire Greystone team and Napa Valley community in the wake of the wildfires was also a valuable lesson. Serving others is what we do best. Service, not servitude, is why we chose this profession. Since I have completed ACAP and am now a candidate for the WBGC program, I’m looking forward to investing more time and enhancing my hospitality knowledge. My professional goals in the culinary arts remain in their genesis. I’d like to serve the community and start a consultant business, as well as a health and wellness bed & breakfast in Tuscany. Through official venues, I also aspire to address the importance of gastro-diplomacy because it has a medium in international relations and foreign policy initiatives. My CIA education will facilitate this by continued professional development forums and actively participating in renowned conferences that the CIA hosts throughout the year. Adjust your attitude, come prepared, and be ready to adapt to change. The CIA is the premier culinary school for a reason. It takes devotion, self-discipline, and commitment from start to finish. Regardless of which program you choose, the classes and the curriculum will be challenging. Being a student here requires you to have a desire for service in the hospitality industry. It requires you to be good in the classroom and equally as proficient in the kitchen. To quote one of my chef-instructors: “Your time at the CIA is not meant to be without challenges or all fun, your time here is meant to be memorable.” In other words, get comfortable with being uncomfortable. If you want to be exposed to innovation and grow professionally, and if you’re ready to step outside your comfort zone, this is the place where you’ll get all of that and much more. Chef Channon Thiede majored in the Accelerated Culinary Arts Certificate Program at The Culinary Institute of America at Greystone. 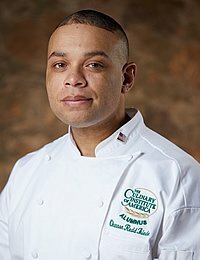 He is a hospitality consultant and private chef in Virginia Beach, Va. Chef Thiede proudly served in the U.S. Air Force prior to attending the CIA.